The MoistTech MB series is an affordable lab method for measuring moisture content that provides a fast and accurate result. Designed for applications in powder, chemical, food and beverage, quality control, paper, clay, fines, mining and many more. The MoistTech MB Series offers a high-resolution back window matrix liquid crystal display (LCD) making it easier to operate and users will have comfort of vision and touch-tone chain plate makes for easier operation. The high precision heat insulation type sensor makes temperature for data acquisition reliable. The use of halide torch for heating and curing make warming more rapid and with shorter test times. 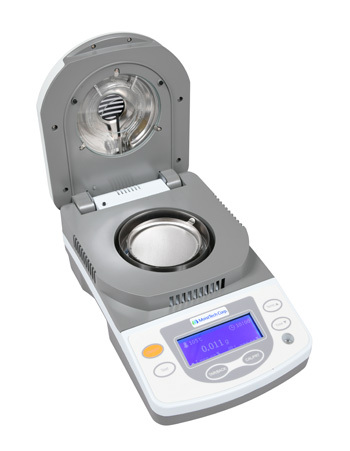 The MoistTech Moisture Balance Analyzer is a high quality, compact and simple to use laboratory moisture analyzer. Designed for a wide variety of applications for accurate and dependable results. with a very simple to use design, the user can set the test temperature, test time or choose auto time sample, add your prepared sample and begin the test process. An audible alarm along with display will alert the user when test has completed.